This is easy recipe results in a very flavorful chicken. 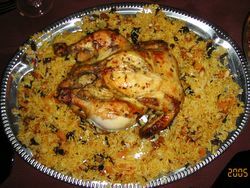 It was wonderful with the accompanying fruited rice and my guests raved about it. The original recipe called for removing the marinade, simmering it for 20 minutes and using it as a basting liquid. If you cook it on the BBQ or in the oven you may want to do that. I didn't bother to do so as one of the advantages of using a rotisserie is not having to baste, but the skin wasn't as crispy as I wish it'd been. In a bowl, combine all the ingredients. Place the chicken in a plastic bag, add the marinade and make sure the marinade penetrates underneath the skin. Refrigerate for 4 hours or overnight.